With our productline of seaweed bread it has not been our intention to make the taste of seaweed overwhelming, but it has been our goal to find the balance between the seaweed and the grain sorts, so the bread gets its delicious texture, crispness and flavour. The flavour of seaweed is hard to define. Immediately you cannot compare to other spices, but the closest we can get to it, is lightly salted with a brush of ocean, which gives a fantastic combination for the bread. 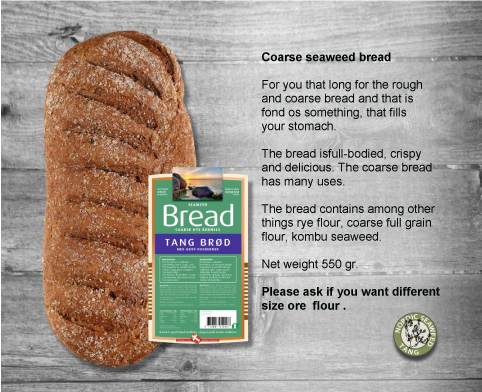 The amount of seaweed we use in the bread is carefully measured in reference to the presciptions, that are available regarding daily use of seaweed. For you that long for the rough and coarse bread and that is fond os something, that fills your stomach. The bread is full-bodied, crispy and delicious. The coarse bread has many uses. The bread contains among other things rye flour, coarse full grain flour, kombu seaweed.